Between 1954 and 1994 the Dutch airbase Soesterberg hosted a USAFE squadron. This squadron was initially designated 512th Fighter Day Squadron, in 1955 redesignated 32nd Fighter Interceptor Squadron and later 32nd Tactical Fighter Squadron. 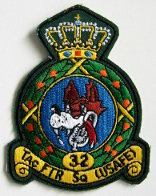 Unlike other USAFE squadrons, 32nd TFS was placed under command of KLu (Royal Netherlands Air Force) in the air defence role, making it the only Royal USAF squadron. From 1959 on this is symbolized by the officially approved addition of a wreath around the squadron badge. More details on markings are listed at the bottom of this page. 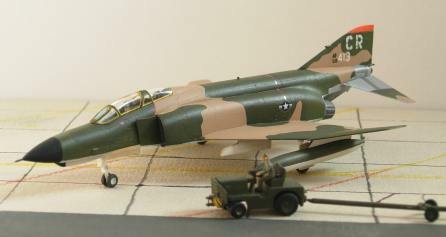 In 1968, 32nd TFS was the first USAFE squadron to receive the F-4E Phantom II. In the decade that followed, they must have gone through more than a hundred F-4E's, as usually 32nd TFS was the first to receive the very latest models, handing down their older models to other USAFE squadrons or returning them to the USA. Especially in the later years of the Phantom, mods were frequent: TISEO (a video camera fitted to the port inboard wing leading edge) and slatted wings, 32 TFS flew it all. This particular aircraft is an easy one: an early F-4E-39-MC that was only briefly assigned to 32nd TFS before being rotated to another USAFE squadron. Therefore it never wore the full 32nd TFS markings: no squadron badges on the intakes and just stencilled 'CR' marks on the tail. 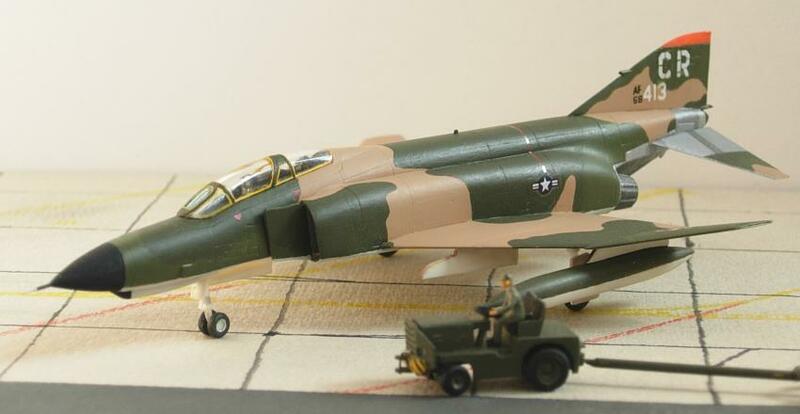 Of particular interest is the very pale shade of tan in the camouflage (on pictures it is really stands out among the regular F-4E's) and the 'AF 68' codes on the tail in black instead of white. The model is an LS kit, which I built almost straight from the box. The only modification I made was cutting down the gun fairing to the shorter early shape (ie. without the 'Midas 4' flame-damper) and replacing the pitot tube with a piece of stainless steel magazine staple. Of course I added some details, such as cockpit interior and black/yellow striped ejection seat handles. Date finished: July 17, 1984. This model depicts an F-15A Eagle in its typical all-weather interceptor configuration. Contrary to the F-4E's which were often seen flying with just 2 AIM-7's (or none at all), the F-15A was usually fitted with a full complement of AIM-7's and AIM-9's (live ones, not practice rounds). The model is painted in standard camo with the full-color 32nd TFS badge on the port intake side (handpainted) and orange bands across the outer tips of the tail fins (I have yet to find the courage to add tiny gold-leaf royal crowns to the centers of these bands !). The model is (of course) an LS kit. 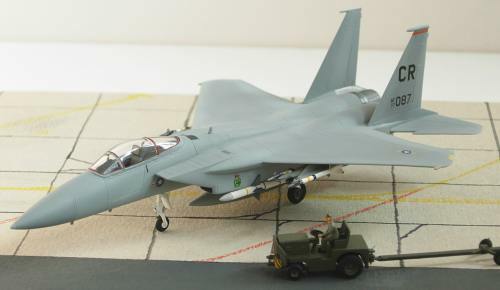 Being LS's first ever 1/144 jet, this kit is not flawless but is still miles ahead wrt shape and accuracy over the Otaki, Crown/Revell and Dragon kits (note that ARII reissued both the Otaki kit and the LS kit, the latter being labeled as F-15C). the pod on the tip of the starboard fin is a very thin tube on F-15A models, so I replaced it with a piece of fine stretched sprue. Kit stores are limited to 4 AIM-7F Sparrow missiles. I added wing pylons, centerline pylon and a belly tank from scratch and 4 AIM-9L Sidewinder's from my spares box. Date finished: April 1, 1994. The 'American' section of Soesterberg airbase was named 'Camp New Amsterdam' and was assigned base code 'CR'. This base code was used as a tailcode on the F-4E and the F-15. The original squadron color assigned to 32nd Sqn was green FS.34109 (e.g. three green bands with white borders across the tailfin or around the rear fuselage), although often red/white/blue (applied as fuselage bands or on the tailfin) was used instead. In 1969 the squadron color was changed to orange and applied to the tip of the tailfin (F-4E) or as a band across the tailfins (F-15), orange being the family color of the Dutch royal family. A goldleaf crown was superimposed on the center of the tailbands on the outer tail surfaces of all F-15s. Over the years the background of the 32nd Sqn emblem changed from pale green (F-100C, F-102A) to emerald green (F-4E and F-15) and after the squadron was upgraded to Fighter Group to cyan blue. As is usual with USAF aircraft, a squadron emblem is applied to the lefthand side of the aircraft whilst an emblem of the parent wing is applied to the righthand side. From 1955 until 1960 32nd Sqn was assigned to the 36th Tactical Fighter Wing, but I have not found any examples of 36TFW insignia applied to 32nd Sqn aircraft. During the 60ies 32nd FIS was assigned to the 86th Fighter Interceptor Wing (later 86th Air Division), between 1964 and 1966 the 86th AD emblem was applied to the starboard side of the tailfin of most 32nd FIS F-102s. From 1968 onwards, 32nd Sqn became a Tactical Fighter Squadron, directly assigned to the 17th Air Force. The 17th AF emblem was applied to the righthand side of the fuselages of 32nd TFS F-4Es and F-15s. In 1989 32nd TFS was upgraded to 32nd Tactical Fighter Group, consisting solely of the 32nd TFS. 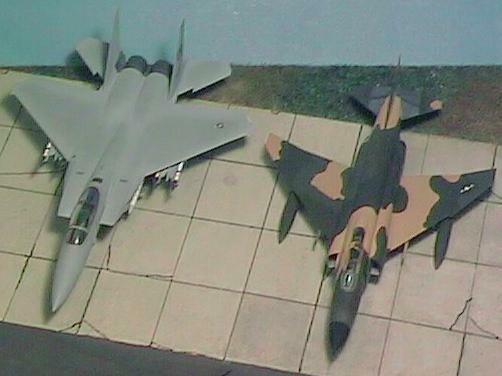 The only change in appearance of 32TFG 32TFS F-15s was the color of the disc of the squadron emblem, which was changed to cyan blue. On some aircraft the 17AF badge on the righthand side was replaced by a 32nd Sqn badge.